WHITTIER – Santa Fe High School students received a sobering look at the real-life consequences of driving impaired as they watched a simulated car crash that claimed the lives of classmates during an “Every 15 Minutes” event held April 3-4. 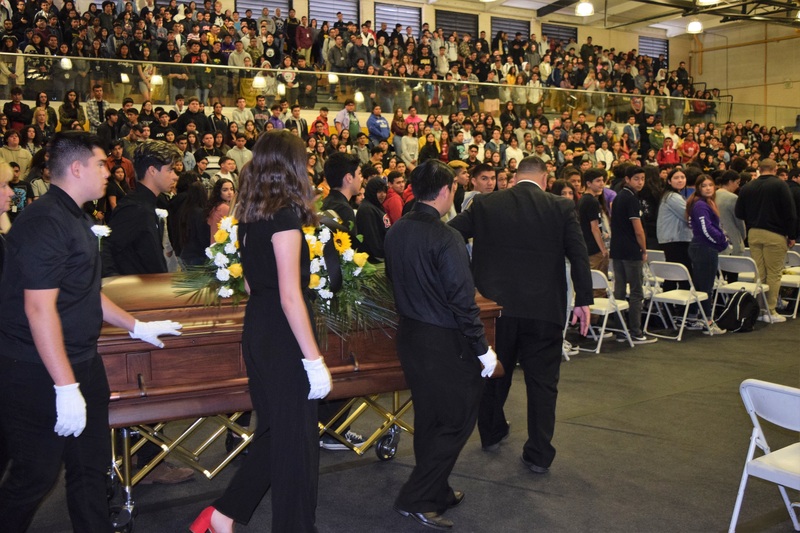 Presented with staged images of classmates bloodied and motionless, Santa Fe juniors and seniors sat silently as they observed what happens in the moments after a DUI: the 9-1-1 call, the arrival of police and paramedics, a sobriety test and arrest, injured victims being taken away by ambulance and helicopter, and a deceased person loaded into a coroner’s van. Throughout the day, the “Grim Reaper” went to classrooms every 15 minutes to take students away from their friends and families. The students were taken to a retreat and not allowed to communicate with the outside world. The next day, a mock funeral was staged in the gym and included the parents whose children were taken away for the night. Students, parents and staff watched a video that showed the moments before, during and after the crash. Parents talked about the emotional toll taken by losing their child for just one day, and how tragedies like these can be prevented. Santa Fe senior Analis Fussell – one of the students taken by the Grim Reaper – knew ahead of time she would be selected, but was still fraught with anxiety. 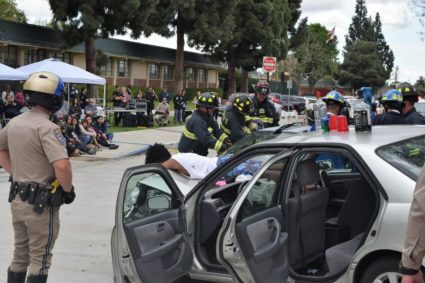 The two-day program was sponsored by the California Highway Patrol, Santa Fe Springs Department of Public Services and Health First. Among the participants were Whittier Police, Santa Fe Springs Fire Rescue, L.A. County Coroner and Guerra Gutierrez Mortuary. 041019_WUHSD_EVERY15MINUTES1: A crash scene unfolds in front of Santa Fe High School as part of an “Every 15 Minutes” program held April 3-4. The event included a simulated car crash that left students injured, resulted in a death of a student and prompted the arrest of another. The program is meant to inspire teens to think twice about driving under the influence. 041019_WUHSD_EVERY15MINUTES2: Santa Fe High School holds a mock funeral service on April 4 as part of an “Every 15 Minutes” program, which is meant to inspire teens to think twice about drinking and driving. At the service, student participants were reunited with friends and family.